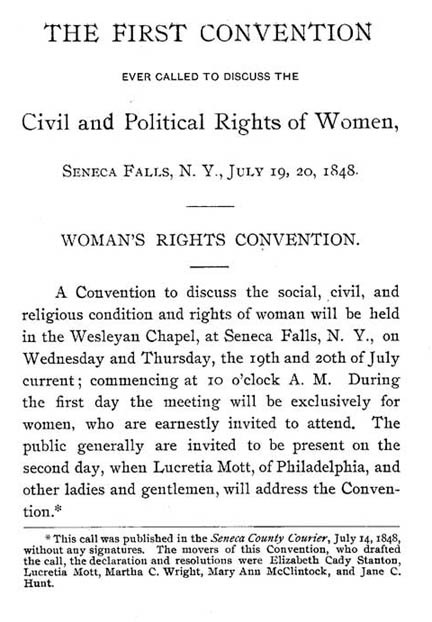 Today is the 167th anniversary of the of the first Women’s Rights Conve ntion in Seneca Falls, NY., held on July 19-20 in 1848. Elizabeth Cady Stanton, one of the most prominent suffragists in US history, drafted the “Declaration of Sentiments” adopted at that convention, which is considered the foundational document for the suffrage movement. For the rest of her life, she was devoted to the cause teaming up with Susan B. Anthony. Her daughter Harriot Stanton Blatch followed her mother’s path and also became an innovative leader of the suffrage movement. Become a member of the “19th Amendment Giving Circle” and support the construction of the Turning Point Suffragist Memorial by clicking on this link. Please list the amount of your pledge and under COMMENTS that you want to be included as part of the giving circle. Your contribution of $1000+ will also ensure your name is included on our Donor Wall at the Turning Point Suffragist Memorial.